Gauge isn't important for this, as long as your yarn, hook and tension result in a fairly tight stitch that won't let the stuffing poke through. Numbers in ( ) at the end of each round or row indicates the total number of stitches in that round or row. F/O. Stuff head moderately firmly while shaping. Begin stuffing at this point if you haven't already. Stuff moderately firmly while shaping. Continue to stuff as you progress. F/O. Leave tail. Weave tail through last round, tug to close up. Secure and weave in end. F/O. Stuff moderately firmly. Weave in end. F/O. Stuff the 'bud' with the tails of yarn, that's probably all the stuffing you'll need in them. F/O. Place the two leaves together and whip stitch around edges. At stem and base (rows 26-31) fold together and whip stitch, leaving the final row 'open'. I highly recommend pinning all parts together before sewing to ensure you have everything made and that all the parts are positioned as you like. Sew head to body positioned as shown. Leaf is sewn to top center of head as shown, you may wish to tack the leaf to one side of the head (optional). Buds are sewn around the neck at the point where the head joins the body. Position the first bud center of the front, and remaining buds evenly spaced around the neck. Front legs are sewn slightly under the front of the body, while back legs are positioned slightly to each side (as shown). Legs should be positioned so that the last row of 7 sc is facing up and outward (giving the legs a light tilt). Tail is sewn to the center of backside of body with 'longer' side facing down to give the tail a slight upsweep. Face is pieces of felt cut into the correct shapes (as shown) and sewn on, while the mouth is simply embroidered as shown. Chikorita and Pokemon are copyright of Nintendo. This pattern is an original pattern by Linda Potts (July 2010). Please do not claim this pattern as your own. If you wish to share this pattern, you may link to this pattern but please do not reprint it on your site. You may print and keep a copy for your own personal use but you may not sell or distribute it, or sell items made from this pattern. Oh sweet! 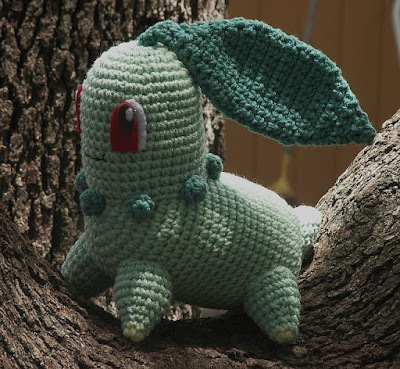 I wanted a Chikorita pattern so badly but was afraid you'd never make one since you already did Bayleef. This looks great and I can't wait to try it out. Thanks for sharing all of these with us. I, for one, greatly appreciate them! I'm so pleased!! 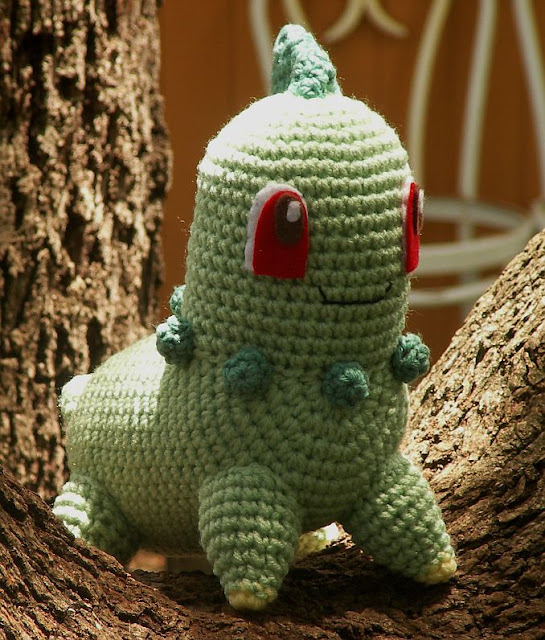 My daughter loves loves Chikorita and I too have been hoping you'd make one. I've made Psyduck, Pikachu, Raichu, and Cydaquil for my girls and there are constant Pokemon battles in my household! They also found my "stash" of your other Pokemon patterns that I printed out and I now have to make two of each of the rest of them! Anyway, thank you for sharing these patterns. They're making my kids very happy! I love this pattern! Thank you for showing me how to do a leaf I have been looking for a mini tutorial for making them for ages. I can't wait to get home and try it ^_^. Miles de gracias!!! por tantas cosas bonitas y por tu generosidad al ponernos los patrones. Yo estoy empezando y tener el patrón me soluciona mucho la vida y mis niños no sabes lo felices que son. *chuckles* My daughter has finally convinced me to start playing Pokemon on my DS, and Chikorita is my first Pokemon, so... this is a very timely post for me!! And let me just say, I love your patterns, and they have saved my bacon a time or two, since both of my kids are Pokemon (and Mario) nuts! This is a wonderful pattern! Thank you for all of your hard work and I really appreciate it! Great Job! omg ty so much for your patterns and that they're free. 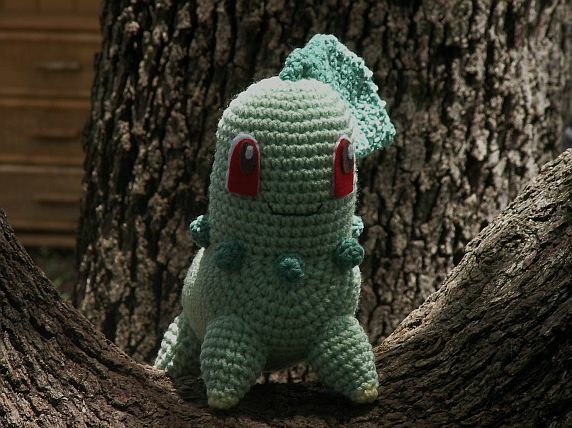 i have been tring to make a chikorita for my best friend for the past year and now u have guided me. and now u have the best pokemon ever? umbreon? omg. give ur self a hug cuz u rule! u make me so happy im going to throw up. 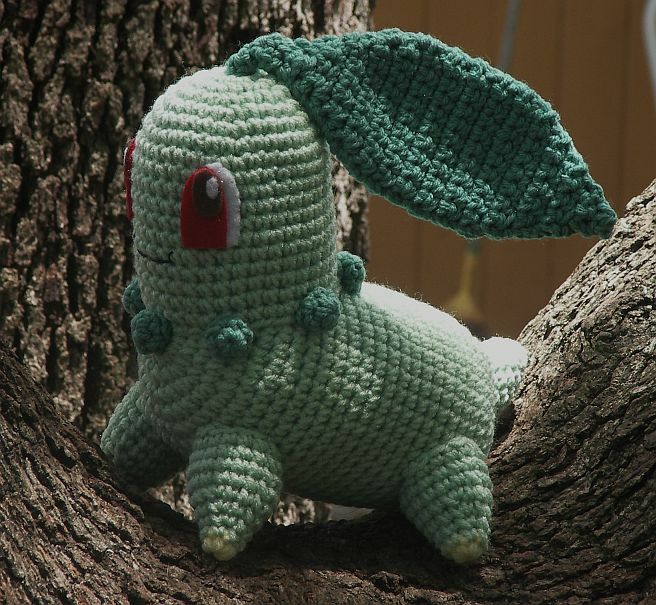 Chikorita is my *favorite* starter Pokemon and your pattern is DARLING! I'm a new crocheter (I am primarily a knitter) but I am very interested in trying one (or more!) of your patterns. I saw on a couple other pages where you mention that you have a list of Pokemon on your list to do next. I don't want to bother you but I can only imagine how adorable your version of a Togepi would be! I'll, of course, check up on you but it would be so cute! 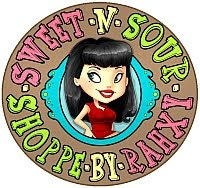 :) Thank you for sharing such wonderful designs with us! Riolu and Lucario,togepi evolution line,the "Eeveelutions" and SO MANY MORE!!!! I am going to use them to make christmas presents! 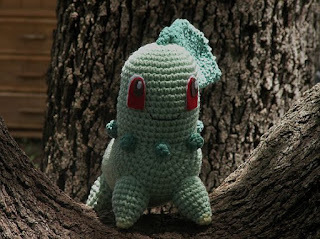 heey, tnx the kids i babysit really love them all, only can you make a pattern for a bulbasaor for me? I cannot figure out how to do the leaf at all... D: I've tried a few times now but, within the first 4 or 5 rows or so, I end up with this messy clump. I'm not sure if there's something you can explain or anything to help me, but if you could explain something or crochet the first few rows and take pictures along the way or *anything* it would be wonderful. >.< I'm nearly done with all of the other parts, and it would be sad if I was unable to finish because I figure out how to correctly start the leaf. I didn't include the 'turn' at the end of each row, because that is generally understood when working in rows unless otherwise noted.